What About Growing Fruit Trees In Your Home?! While fruit trees in my mind have traditionally been associated with Pasadena groves and estates in La Jolla, there is a way to scale citrus-growing into a right-now, today activity. I am enamored by indoor citrus. Not to mention, in old school feng shui philosophy, orange trees will help you get rich and lemons will help you make more love & babies! 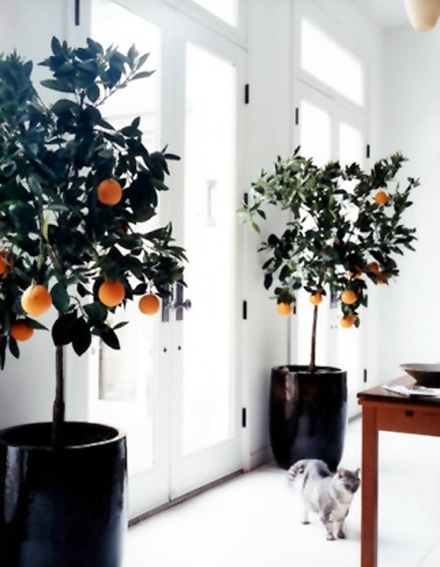 Here’s some indoor & patio citrus inspiration for you to see that this dream of a fragrant grove can find its way into your home right now! How effortless is this amzing potted citrus? I am thrillingly inspired to add these to my new home that gets flooded with light!!! Is there anything more memorable than coming home to oranges that are sweet and bright? Meyer lemons are very lush on these little trees. THESE tips from Apartment Therapy can help you get growing. And, be aware: you can start small and succeed. No bigger than a houseplant, this desktop citrus is yeilding lots of fruit for its size! I agree! I think I may buy another tree since they are quite unique! Hopefully, my tiny tree will grow more is summer on my patio. The “adult size” lemon trees look impressive 🙂 Lol! Previous post: Balanced Beauty In Full Color: Lime Crime Lipstick! Next post: Capturing the Spirit Of Wildflowers!